These composers were all affected by the carnage of World War I, and their elegiac music expresses regret and lost innocence, love won and lost, sacrifice and death. George Butterworth’s A Shropshire Lad, conceived as an epilogue to his Housman song cycles, encapsulates the poet’s sense of life’s transience. Ivor Gurney was both shot and gassed in 1917, and The Trumpet pleads with mankind to set aside the folly of war. Heard here in a new completion, Gerald Finzi’s Requiem da Camera mourns the death of his mentor Ernest Farrar and those of other fallen artists, and Ralph Vaughan Williams’s An Oxford Elegy recalls lost friends with an intense and magical nostalgia. 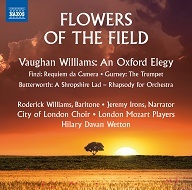 ‘Flowers of the Field is an eloquent tribute to composers whose lives were ended, or irrevocably changed, by the Great War… Finzi felt his loss deeply, and tried to express it in the Requiem da Camera, but he was still very young, his reach exceeded his grasp, and he never finished the work. That job has now been very effectively done by the composer Christian Alexander, and was premiered by the City of London Choir and Hilary Davan Wetton…. Their fine recording now makes this piece a very worthwhile addition to the Finzi discography. Hilary Davan Wetton is surely our finest choral conductor, and does really well on this record with both his City of London Choir, and the London Mozart Players. ‘…Two of the works here appear in versions that are recorded for the first time: Philip Lancaster’s orchestration of the anthem-like choral setting by Ivor Gurney of Edward Thomas’s The Trumpet; and Gerald Finzi’s Requiem da Camera, in a new performing edition by Christian Alexander. Requiem da Camera, which Finzi composed in the 1920s in memory of his teacher Ernest Farrar, who died on the Somme in 1918, was his first attempt at an extended work. Its centrepiece is a baritone setting of Hardy’s In Time of the Breaking of Nations, flanked by choral settings of Masefield and Gibson and introduced with an orchestral prelude that has phrases from Butterworth’s Housman song Loveliest of Trees woven through it. It was never performed complete in Finzi’s lifetime, and has only been recorded once before (by Richard Hickox on Chandos, in a different edition) so this version, intelligently paced by Hilary Davan Wetton with Roderick Williams as the matchless baritone soloist, is a significant addition to the Finzi catalogue. ‘The subject is war and the pity of war. Two of the pieces—Ivor Gurney’s The Trumpet and Gerald Finzi’s torso Requiem da camera—are premiere recordings, sensibly placed between George Butterworth’s orchestral tail-piece A Shropshire Lad and Ralph Vaughan Williams’s An Oxford Elegy, that glorious remembrance of departed youth and promise. Roderick Williams sings richly and with calm authority in the keystone movement of the Finzi Requiem da Camera, and the City of London Choir brings a timeless quality to the same piece and to the Elegy. [Jeremy Irons’s] voice is in period and his diction is flawless on the Matthew Arnold text. The poetry is in the music. ‘Jeremy Irons makes an understated reader for An Oxford Elegy, offering a more matter–of–fact, contemporary take than we’re used to in the more Victorian moments of Matthew Arnold’s verse. He is deftly supported by the London Mozart Players, whose wind solos throughout the disc are especially fine.’ Read complete review on Gramophone. ‘This is said to be the first-ever recording of The Trumpet and I’m pleased to have heard it. There’s good Finzi too…and I admire baritone Roderick Williams, who sings the music about as well as it’s possible to sing it. In the end, all…come off well and serve nicely as tributes to the fallen of Britain and the world.’ Read complete review on American Record Guide. ‘The English pastoral school was reaching maturity as the First World War broke out, and its nostalgic expressivity proved ideal for honouring fallen friends in the decades that followed. This album opens with A Shropshire Lad by George Butterworth, who died at the Somme in 1916. Although the work is often performed, this version is unusual. Rather than wistful evocations, we are presented with direct emotions, in broad, expressive strokes. Finzi’s Requiem da Camera is dedicated to his teacher Ernest Farrar, an early casualty of the war. The tone is noble but personal, and is perfectly conveyed here. Roderick Williams is in fine voice, his tone rich but unforced and his pronunciation admirably clear. Ivor Gurney’s part-song The Trumpet is presented in a recent orchestral version by Philip Lancaster. An air of Anglican observance hangs over the work, intensifying its funereal character.